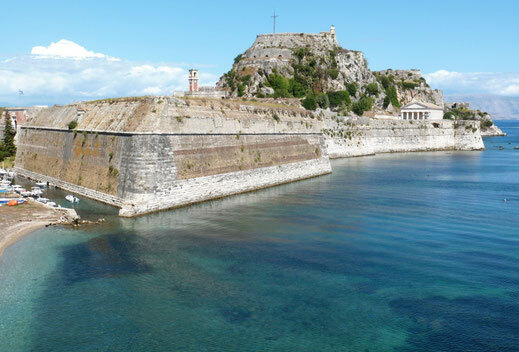 The town of Corfu had its origin on a small rocky peninsula, which in the 16th century was separated from the adjacent terrain by strong bastion ramparts and a channel. This intervention, as well as the later ones, was necessitated by Turkish attempts to occupy this important Venetian possession. As the terrain opposite was a natural rise, the existing positions, being in cannon range, posed a threat in the case of a siege. Therefore, in the last decades of the same century a fort was built on the high ground northwest of the old town and called Forte Nuovo. Subsequently, a long bastion system covering the civil settlement, i.e. the suburb, was added, thus establishing a new line of defence. In the 17th century this system was constantly amended and rendered more complex by the introduction of new fortification elements. 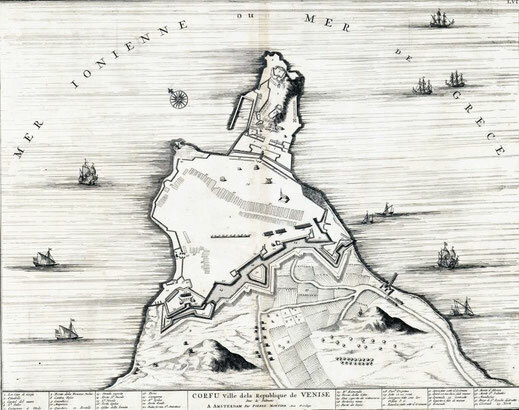 In 1716, during the last Venetian-Turkish war, Corfu experienced the fiercest Turkish attack, which was ultimately repelled. After the war, further fortification was initiated by J. M. von der Schulenburg, the new commander of the Venetian ground forces. Two other elevated positions, S. Salvatore and Abramo, were now secured with forts. For several decades Jančić was also present in Corfu. Well acquainted with the fortress, he produced a number of projects to improve it, but most of them seem not to have been carried out.